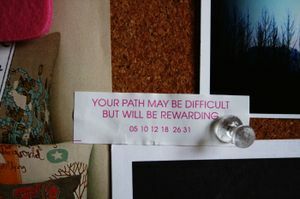 Hhm.....it's funny how these little fortune cookies can be so spot on at times but I know it's pretty generic. Not like most everyone's path can be difficult. But it is true. Thinking back at my most difficult times, I've been rewarded greatly from them. Just being alive and well. Owning a home, having a great partner and true friends and family. That's all very rewarding. Guess I'm just waiting for, what I consider, the ultimate reward for this difficult path J and I have been traveling on for a few years now. We're now taking the next step which is testing and hopefully a diagnoses and treatment. I've been reading a lot about Clomid and hoping that that will be the answer as all the other options such as in vitro are not covered by our health insurance. It's shocking to see the costs on these procedures. I knew having kids would be expensive but goodness. And no, this isn't one of my usual pity posts. I'm going to stay hopeful about this. There are a million and one couples that are going through the same thing. One thing I'm not doing is talking to certain "friends" about this. I just can't take the looks that they give me when I'm update them on my situation. The "I'm sorry you can't get preggers as easily as I or my daughter or sister had" looks. I just can't. But I do want to document this difficult path for my future so you'll read more about this as I go through dr apts and such. On the brighter side, tomorrow's Friday!